Ircon International Limited recently releases an employment notification to hire 35 eligible and capable aspirants for Shift Incharge, Manager, Site Engineer Posts. 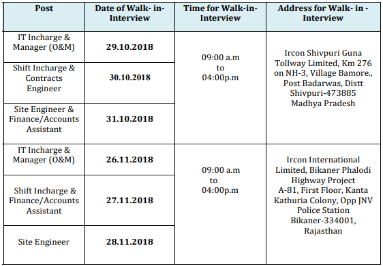 Candidates who are looking for govt jobs in IRCON can apply for this recruitment notification by attending walkin interview held on (29th to 31st October & 26th to 28th November 2018). Candidates must carry copies of all the necessary documents with the application form and attend interview to the address given below along with the required documents. Educational Qualifications For IRCON Jobs 2018: Candidates who have completed Diploma in Engineering/ B.E/ B.Tech Degree/ MCA/ CA/ICWA-Inter from the recognized university or institution with required minimum marks can apply for IRCON jobs 2018. The age of candidate who is willing to apply for IRCON should be born between 01-10-1983 (Post 1-4,6), 01-10-1973 (Post 5). Pay Scale: Qualified Candidates for IRCON vacancies will get a pay scale of Rs. 40,000/- (Post 1), Rs. 50,000/- (Post 2,3), Rs. 35,000/- (Post 4), Rs. 65,000/- (Post 5), Rs. 45,000/- (Post 6) Per month. Contenders for Ircon International Limited Jobs 2018 are selected based on their performance in Personal Interview. How to Apply for IRCON Vacancy? First of all you have to logon to the Official website of organization that is www.ircon.org. 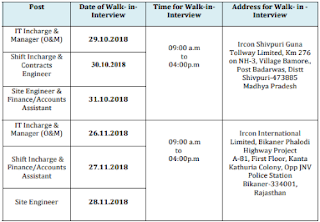 Now candidates who are going to appear in the walk-in-interview are advised to bring all the documents and certificates along with them for verification to below address on 29th to 31st October & 26th to 28th November 2018. Date for the Walk In Interview : 29 to 31-10-2018 & 26 to 28-11-2018.